Agromin Blog: Lee Elementary School in Los Alamitos is in Full Gardening Mode! 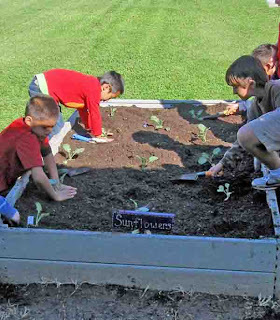 Lee Elementary School in Los Alamitos is in Full Gardening Mode! The second grade classes at Lee Elementary School in Los Alamitos are planting and maintaining five garden areas at the school. Renee Keeler, the students' teacher who happens to be an avid gardener, uses the gardens to teach science lessons and conduct experiments. Agromin, producer of premium organic soils and mulches, donated the soil and mulch used in each of the garden beds. With such a mild winter and great soil, radishes from the gardens are ready for harvest. The progress of other vegetables is just as impressive. The students' purple cauliflower plants are sprouting tiny heads and so are the broccoli. Their snap peas already have blossoms. Planted California poppies are in bloom and their sweet peas are showing flowers. Next up: the students are planting tomato plants that they hope will produce by school's end. The students are responsible for watering, weeding and harvesting all the things they plant, as well as charting growth, documenting water usage and other details under their science curriculum. They love working in the gardens and when the harvests are done, they put salads together to eat what they have grown. The children also had the opportunity to "raise" two monarch caterpillars and watched as they developed, formed their chrysalis and then emerged as butterflies. They were released last week, but have been seen close to home, fluttering around.